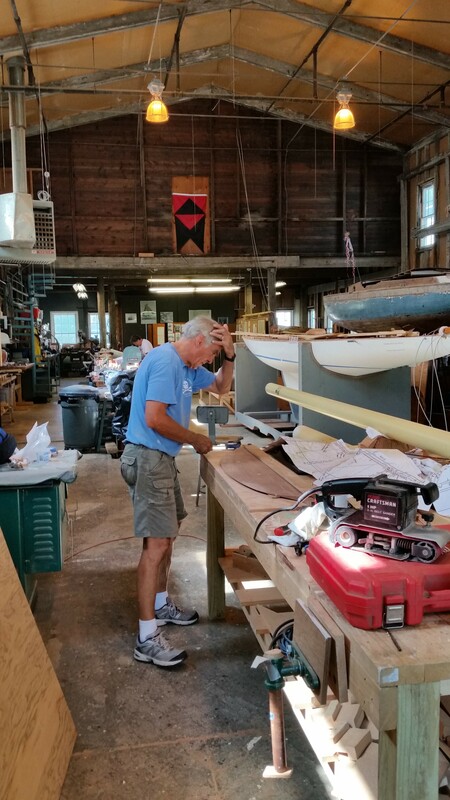 Keith works on the rudder between all the other tasks we give him. He likes engineering problems and more often than not come up with simple, innovative solutions. He has a Notre Dame engineering degree and Michigan advanced degree, so he’s a conflicted soul. Here it looks like he is invoking a higher spirit into a solution. Steve is our amateur Astronomer, so we give him work on our mast so he can get closer to the stars. Tim is a psychologist so we gave him 450 screws to set the boom sail track in place; it’s finicky work that requires precision. We try to play with his mind every once in awhile because we’re worried that in the background he’s writing a “tell all” book about the RELIANCE inmates. In this picture, he has about 150 screws in place – only 300 more, Tim! In the background, Herb is proving his wire to manila splicing technique. 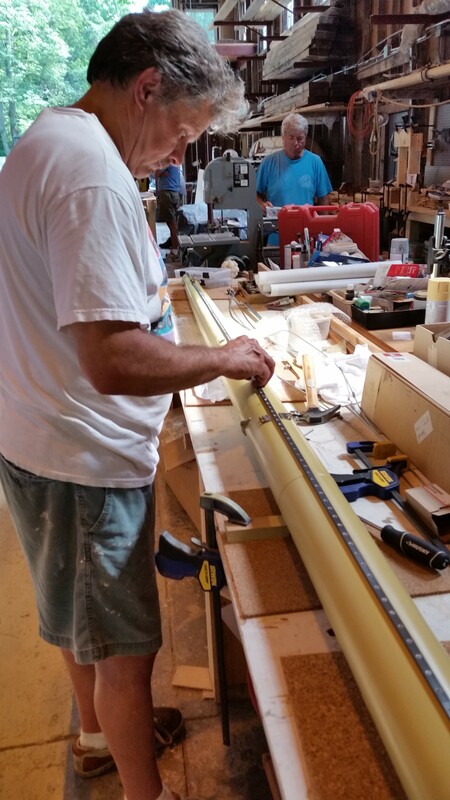 Meanwhile, Laura works on bowsprit rigging. 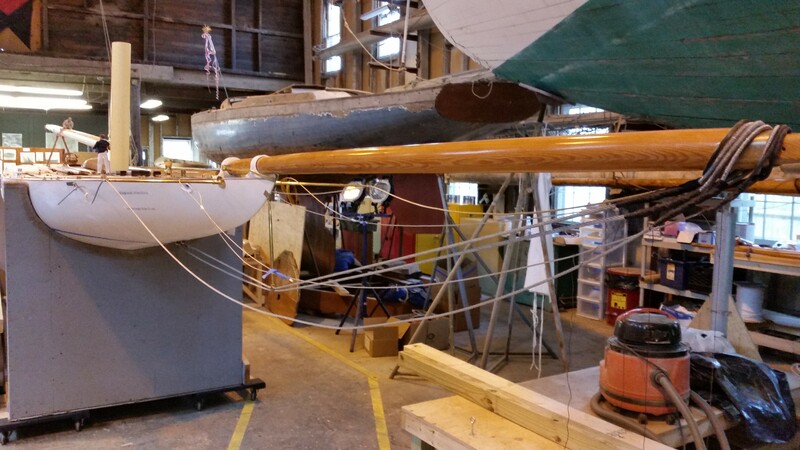 The bobstays are tensioned by tightening the bowsprit retaining bar; there are no turnbuckles on the bobstays. 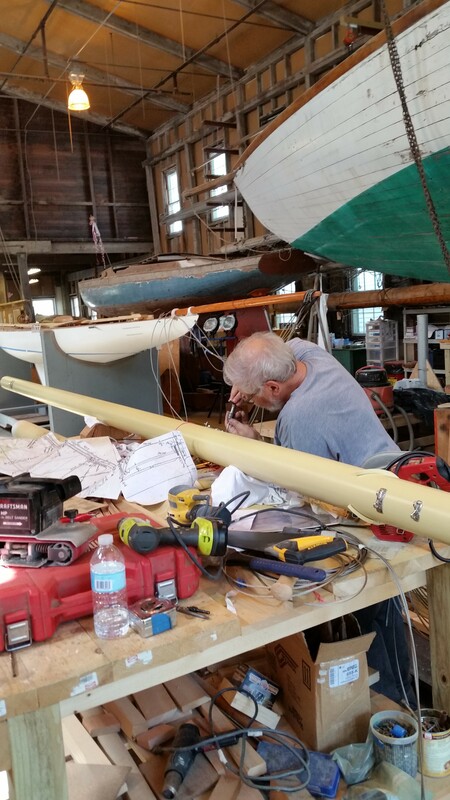 Ken from Hall Spars dropped by on his evening constitutional and we talked about how boats today tension their shrouds with hydraulic mast rams since the turnbuckles are too short to perform this function. He also noted that on large racers rigging eyes are replacing tangs. 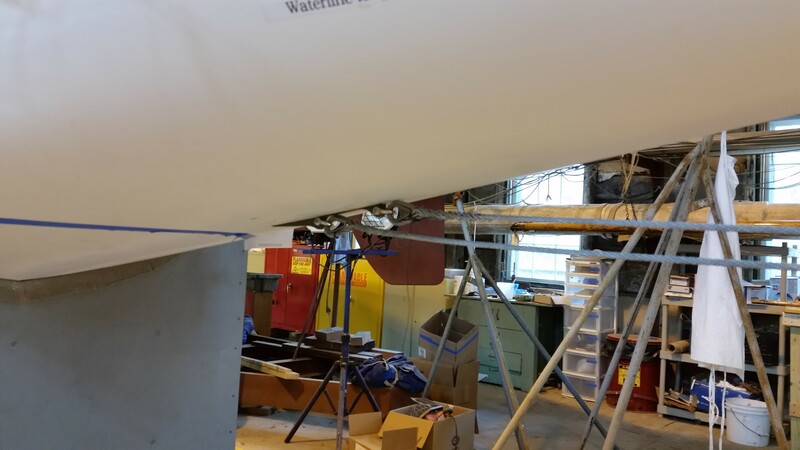 This entry was posted in Project Manager's Welcome and tagged America's Cup, bobstays, Bristol, building 28, Hall Spars, herb, Herreshoff, Herreshoff Marine Museum, HMCo, Keith Bradley, ken, laura, manila, mast, mast rams, RELIANCE, Reliance Model, RELIANCE Project, rigging, rudder, screws, splicing, steve, tension, tim, turnbuckles, wire on August 6, 2015 by Herreshoff Marine Museum/America's Cup Hall of Fame.